Jonny Evans will get an opportunity to impress at the Emirates. 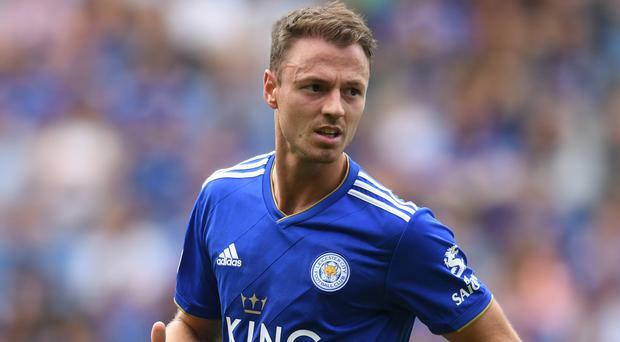 Former Leicester City and Northern Ireland star Gerry Taggart says Jonny Evans could already be reaching a crossroads in his Foxes career at the Emirates tomorrow night. The Northern Ireland defender is set to start against Arsenal with skipper Wes Morgan sidelined for the first of a two-game Premier League ban following his sending-off against Everton earlier this month. The 30-year-old has endured a challenging start at Leicester since his summer move from West Brom and has spent much of his time on the bench after picking up an injury in pre-season. Veteran Morgan has been favoured at the heart of the Foxes defence alongside highly-rated England international Harry Maguire. “Jonny has struggled a little bit having come to the club with a good reputation,” Taggart, 48, told the Sunday Life. “He was in the side for the season opener against Wolves and didn’t have the best of games even though none of his mistakes led to goals. “Wes was brought back into the starting XI, didn’t do anything wrong and has deserved to be in the team. “It is never going to be simple to dislodge the club captain. Much of that team has been set in stone for the last three or four seasons. It is a very settled side. Eighty per cent picks itself. “Jonny would have been the last one to expect to walk into the side. He has had a couple of goes and found himself out of the team both times. Now he has another chance. “He has now to lay down a marker against Arsenal. There will be some question marks over Wes because he’s been sent off twice now for rash challenges and we are only in October. Leicester were able to secure Evans in a cut-price deal from relegated West Brom in the summer after tracking him for over a year with the Gunners and Manchester City also showing interest. They have won all four games that Evans has started — including two Carabao Cup outings — and Taggart believes that he continues to hold the trust of Puel. After a slow start, Taggart says Evans is returning to the sort of form that made him sought after and he can establish himself as a regular starter. Taggart, who won the League Cup with the Foxes during six seasons at the club, added: “It is decision-making time for the manager because I thought in the last game Jonny did very well and did not deserve to be dropped but was because it was Wes. “It is a bit of a quandary (for Jonny) and he probably considers himself unlucky. His performances have been better than average. “Jonny is a Puel kind of player. The manager wants to play it from the back and Jonny is comfortable on the ball whereas that is not one of Wes’s strengths. “Where Jonny has let himself down perhaps is that, if anything, he has tried too hard. Instead of just trying to play the simple pass under pressure he has tried to force the issue and got into some bother. “Thankfully, nothing came of it but at that level you cannot have your central defender making wrong decisions under pressure and Wes rarely does that. Former Arsenal manager Arsene Wenger was known to be an admirer of Evans, while Pep Guardiola considered adding him to his stellar squad last January. Despite this, Taggart doubts Evans will have any regrets that he is plying his trade at the King Power Stadium. He continued: “To be fair, he is one of those players who sees what’s in front of him and cracks on. When things didn’t go his way at West Brom he just put his head down. “Who knows how close he was to going to Arsenal? Nothing came of the rumours. I would doubt he regrets coming to Leicester because he is in the Premier League.